DESCRIPTION Bright 2,100+ sq ft elevated bungalow overlooks a pristine farm. The property includes 80 x 224 insulated indoor arena - LED lighting, 800,000 BTU radiant heaters, R40 ceiling and R28 walls - low cost to run. Massive outdoor riding arena, 2.8ac grass grand-prix field. 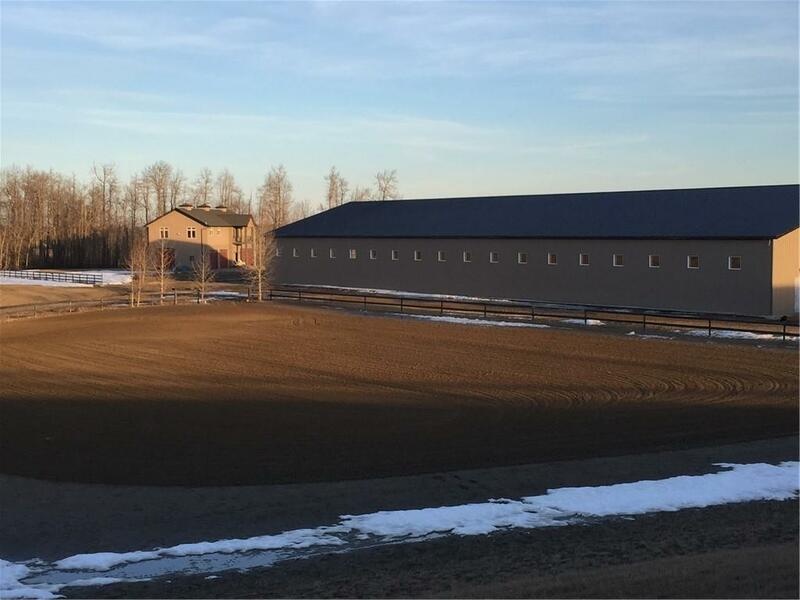 Trails, generous grazing paddocks for turn out, 8 naturally sheltered winter paddocks with 9 horse sheds, 5 heated dual water troughs, 48 x96 hay barn, 32 x72 equipment shed. All robustly built. Trees and creek and topography make idyllic setting to surround 60 acres of beautiful hay fields producing $20,000 worth high quality hay each year. The custom designed residence is configured to become 2 self-contained apartments or remain as a 2 or 3 bedroom home, with hardwood floors, three fireplaces, and serene pastoral views from every window. Below is a large garage and large shop with 11’ ceilings, in-floor heat, H/C water, 220V wiring, 3pc washroom, extra laundry, and shelving. Well produces 10gpm of the best tasting water around. Brilliant neighbours, natural sandy soil, 5 min to Hwy 2 make this property one you need to consider. Indoor arena was built to commercial specs and with small modifications will pass inspection for commercial usage. Every development on this property was placed with future expansion in mind to allow for the highest quality environment and lifestyle. All equipment for maintenance and haymaking can be negotiated separately. Courtesy: BENEDICT DEVLIN REAL ESTATE SERVICES INC.
Courtsey of BENEDICT DEVLIN REAL ESTATE SERVICES INC..
Home for sale at 34202 Range Road 13 Rural Red Deer County, Alberts T0M 0K0. Description: The home at 34202 Range Road 13 Rural Red Deer County, Alberta T0M 0K0 with the MLS® Number C4235811 is currently listed at $1,590,000.